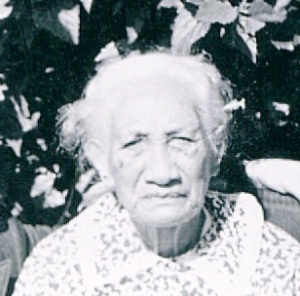 Lilia Wahapaa was born on December 27, 1835 and died on November 12, 1944, living a long life in the Hawaiian Islands where she was known for her testimony and service. She was one of the earliest converts to The Church of Jesus Christ of Latter-day Saints, having been baptized in 1853 by Elder Kaulaulau of Maui, who had been sent by Elder George Q. Cannon. Lilia moved to Laie, Oahu, with her family in 1870. There she met and married Makuakane and they became parents to a daughter before he died. She returned to her native Kauai and married Kaneihalau Papa. They became the parents to eight children. After her second husband died, she married Keoua. Eventually he died too, and she outlived eight of her nine children. At the age of fifty-eight, Lilia became president of her ward Relief Society and served for thirty-three years. She was released at the age of ninety-one. She was visiting her grandson George Kauhi on Oahu when the Japanese bombed Pearl Harbor on December 7, 1941, and she was forced to stay several weeks there. She returned to her home by airplane—her first flight—and continued to be an inspiration to her ward and family. Although she lost her hearing, she could still read and remained alert. She walked to church every Sunday until her death. This page was last edited on 1 February 2017, at 14:22.